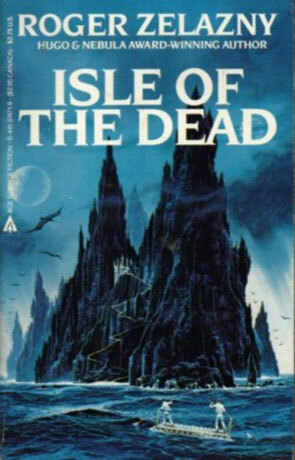 Isle of the Dead is a classic science fiction novel by Roger Zelazny. This book never really took off for me. It kept reminding me of I. Bank's AGAINST A DARK BACKGROUND, but it was no where near as nutty and multi layered as the Bank's book. This was only about 190 pgs and took an afternoon to read. Basically the plot is a feller by the name of Sandow who is very wealthy and follows a religion like hinduism which was started by Pei'ans where some of the deities can inhabit the worshipper and use power pulls which are distributed all over the universe. The gods, like all good gods, have to fight other gods. Sandow is getting photos of people he knew whose downloaded memory has been stolen so they cant be reincarnated/regrown. Zelazny makes some fun twists in this book, but it could've been longer and more fleshed out with it's plot and especially the developement of the all encompassing religion that everyone seems to enjoy stepping in. Written on 1st March 2001 by TC.